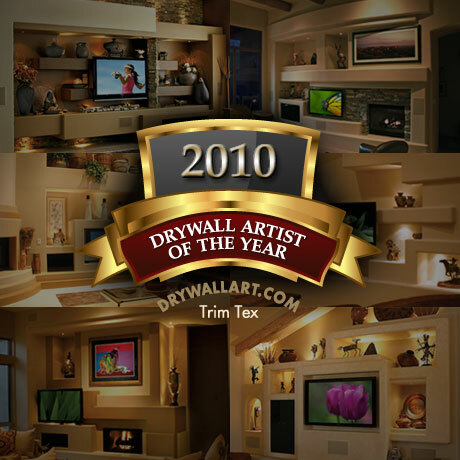 We’re excited to announce that DAGR Design has been named Drywall Artist Of The Year for 2010 by Trim-Tex, a drywall industry manufacturer. Please read the press release below for details. Drywall As An Art Form? Home Theater Design Firm Named Drywall Artist Of The Year. August 15, 2011 – Scottsdale, Arizona – Drywall may not be the first thing that springs to mind when thinking about “fine art”. But the talented team of designers and installers at DAGR Design do consider their craft more art form than building trade. The Scottsdale-based firm designs and builds stunning custom home entertainment centers that combine drywall with materials like native stone, glass, and wood into beautifully sculpted designs that capture the eye and look like they truly belong to the rooms they occupy. Company founders Dave Murphey and Greg Johnson characterize their work as artistic antidotes to mass-produced furniture entertainment centers and “boxy” built-ins. Their designs add value to a home, either by blending seamlessly with the style of the room or standing out as a focal point. DAGR custom media walls, home entertainment centers, and custom home theater designs grace some of the finest homes in Scottsdale and Phoenix. And it seems they’ve also caught the eye of drywall trade industry manufacturer Trim-Tex Inc., who this year awarded DAGR Design the coveted Drywall Artist Of The Year Award. Trim-Tex, a leading provider of drywall corner beads, tools and accessories, reviews a long list of contenders each year to hand pick the recipient for the Drywall Artist Of The Year Award. Even to be considered, the drywall artist must be someone who has both top-notch design skills, and consistently pushes design boundaries for the medium. “We’ve always believed our focus on true custom design was a big part of our success with clients, and we’re happy that we’ve been recognized for the hard work of our entire team,” said Dave Murphey, DAGR Design co-founder. Ready to create your new custom media wall? An inspiration gallery of modern media wall designs featuring horizontal fireplaces. Open concept media wall designs are a perfect fit for today's more casual floorplans. A custom media wall designed from scratch isn't always the best, or most cost effective, solution for every homeowners' situation — different clients have different needs. Design Inspiration: Add glow and warmth to your home by adding a fireplace to your custom media wall design. Ready to create your new media wall, or have a pre-sales question? © 1998 - 2019 DAGR Design. All Rights Reserved. All content displayed on this site including, but not limited to, product designs, text, graphics, photographs and video are the intellectual property of DAGR Design, Inc., and as such are protected by copyright. No content of any kind may be reproduced in any manner without the express written consent of DAGR Design. DAGR Design, The DAGR Design logo, The Art Of Entertainment, and Custom Media Walls are trademarks or service marks of DAGR Design.